New for 2017 is our Craft Beer Soap. What do we mean by bees, butterflies and dragonflies? We support the BEES and a portion of the sales of our Beer Soap goes to the World Wildlife Fund WWF to help preserve vital bee and wetland habitats. Available in 16 oz. bottles and 3 Scents: ESB, Grapefruit Saison and Lavender Lager. Our ESB (Exotic Soap Brew) combines Beer and Honey into a hand and body soap. If you like our Nightscapes slice soap you are going to love this rich earthy blend of Amber and Madagascar Vanilla with an aromatic peppery bouquet of Jasmine and sandalwood finished with the nuances of blood orange and grapefruit. As the days get longer and 2017 begins to unfold here at the Essential Journeys® Soap Studio we are in Creative Mode. We spent 2016 dreaming up NEW Products with NEW Directions. We are excited to roll out many NEW products in the coming months. Grapefruit Saison and Lavender Lager. With this new line of liquid soaps we will be donating money and educating people on preserving wetlands, wildlife and wild-places. Our NEW and IMPROVED Grapefruit Saison Soap takes our best selling Grapefruit Splash formula and replaces some of the water with beer, a wonderful lathering agent, and honey. 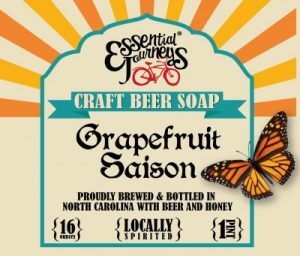 Essential Journeys® Grapefruit Saison Soap Brew is locally spirited (like the beer) with a vibrant personality born of agrarian roots. A light and refreshing nose of grapefruit tartness this hand and body soap is made from biodegradable surfactants and natural botanicals. Not long ago Old World Belgian Style Beer was considered rare and endangered. Today the Monarch Butterfly is on the cusp of being endangered. Their annual migration pattern leads them over the Blue Ridge Parkway and onward to Mexico for the winter. A portion of the sales of our Beer Soaps will go to the World Wildlife Fund WWF to help preserve vital butterfly habitat.